For my 27th birthday, I wanted to go to Las Vegas. I stayed at the beautiful Palazzo Las Vegas. This hotel is stunning, and is the sister hotel to The Venetian. Nearly double the size of your average Las Vegas hotel room, The Palazzo's standard Las Vegas hotel suites have everything you need and more. 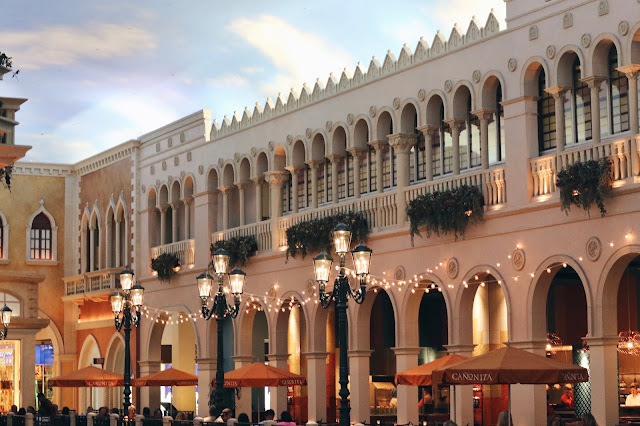 I loved everything about The Palazzo, from the ideal location on The Strip, to the variety of gourmet restaurants, to the endless entertainment, shopping, and casinos. I spent three nights, four days here. Normally, that is a super long stay for a Vegas trip, but The Palazzo hotel has so many things to do (including The Aquatic Club at the pool, and Canyon Ranch Spa), it's actually hard to be bored. In fact, I wanted to do absolutely everything there was to do, between The Palazzo and The Venetian. If I were to state I had so much fun during my stay, that would be an understatement. The Palazzo truly makes you feel like it's your home away from home! The service at The Palazzo is outstanding, and it's quite obvious The Palazzo is one of the nicest hotels on The Las Vegas Strip. I was upgraded to a two bedroom suite, (it was bigger than most people's apartment's), on the 47th floor. The view from the tall windows in each room was incredible. I had so much space in my suite, I didn't even go into the second bedroom. I've never said that before. I flew in really late around 10pm. Lucky the airport is super close to the Strip (only a fifteen minute drive). 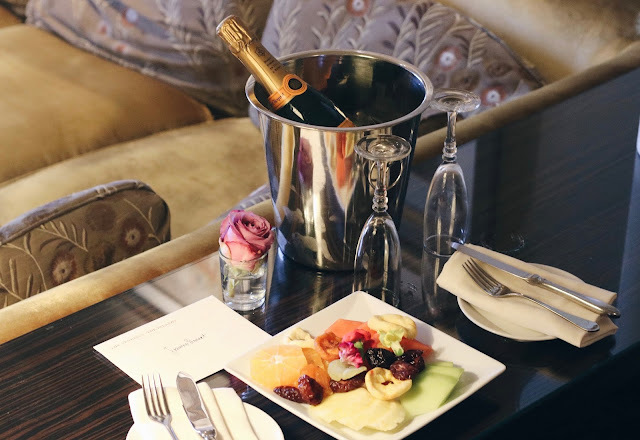 I was welcomed with a bottle of Veuve Clicquot champagne, and delicious assorted fruit upon arrival. I decided that since I was in Vegas, you couldn't go to bed early. After checking in, I headed to Tao Restaurant for dinner. Tao is an Asian Bistro restaurant, and is located inside The Venetian, which is conveniently connected to the Palazzo. After dinner, I played my favorite game, roulette at the casino. I am sitting in the "O" of the "LOVE" art exhibit. On my first official day, I went downstairs to explore the Palazzo. I visited the Atrium Shops, which are right downstairs from the hotel room's elevator's. The Atrium is located adjacent to the 105,000-square-foot casino. This new high-end retail concept is a celebration of modern luxury. The Atrium offers a curated experience to upscale retail connoisseurs seeking apparel, accessories, cosmetics, fragrance, and liquor. 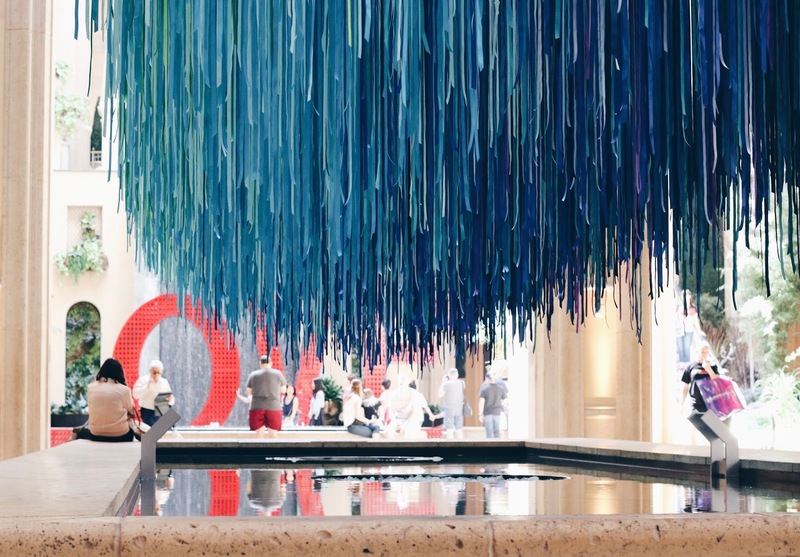 "Another Sky" is a stunning new installation which debuted in June 2017 in the Waterfall Atrium. Conceived by artist Anne Patterson, and inspired by the sky, Another Sky features approximately 32 miles of reflective ribbon in the soaring 55-ffot atrium ceiling. It is truly a stunning sight! I had lunch at Chica, a Latin Cuisine restaurant located at The Palazzo. Crafted by celebrity chef Lorena Garcia, Chica delivers the robust and vibrant flavors of Latin cuisine combined with a dynamic wine and mixology program. Between The Palazzo and The Venetian, there is endless entertainment, food, and shopping! What else could you ask for?! I went on a fun gondola ride after lunch near The Grand Canal Shoppes. The Grand Canal Shoppes are so beautiful, it looks like you are really walking outside in Italy. 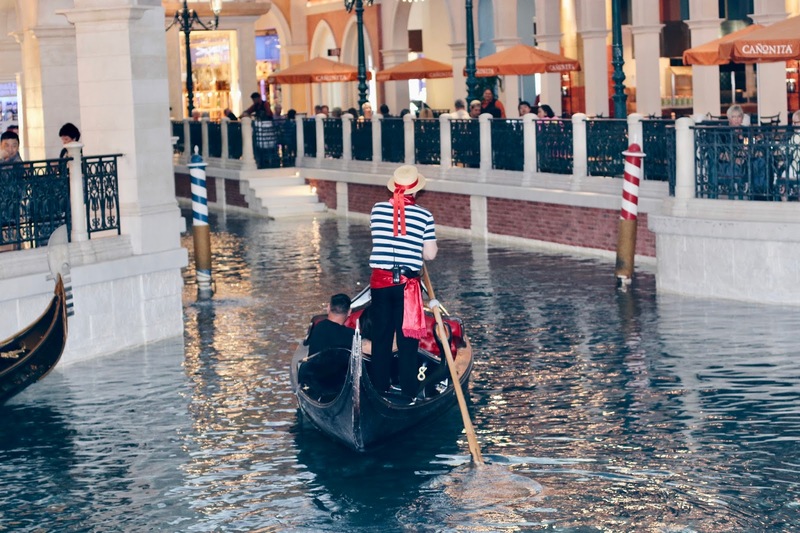 You can do the indoor gondola ride, that is located in the center of shoppes, or you can do the outdoor version, (I did this one), located in front of The Venetian Hotel right one The Strip. I highly recommend doing either one, it's a great experience. The indoor gondola ride located inside The Grand Canal Shoppes. 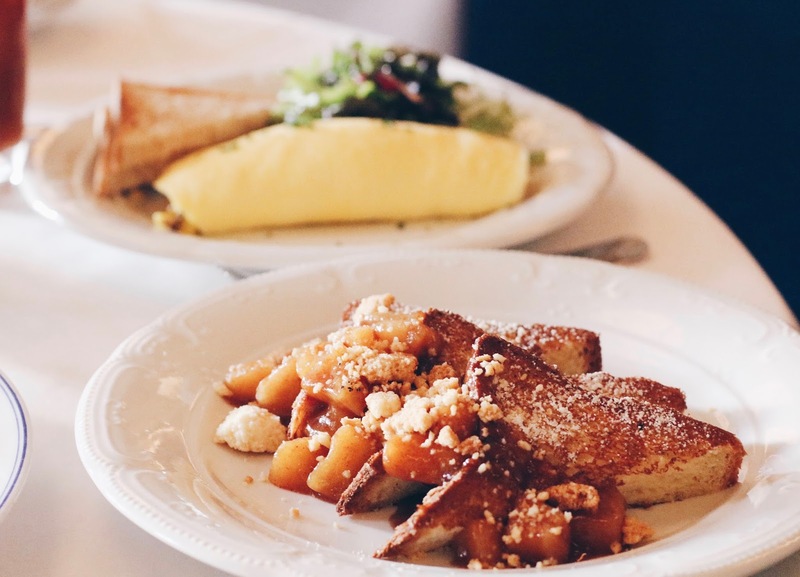 When you stay at The Palazzo, you have so many food options, finding a restaurant will never be a problem. 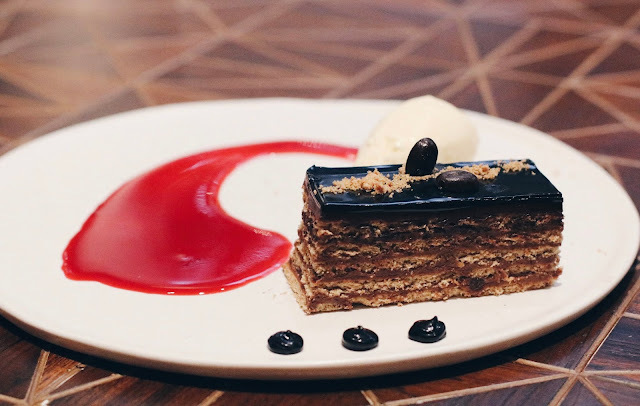 There were so many restaurants to try, including LAVO Italian Restaurant, CUT by Wolfgang Puck, Sugarcane raw bar grill, Morels Steakhouse & Bistro, Bouchon, TAO Asian Bistro, and Yardbird Southern Table & Bar- just to name a few. You can find the full restaurant list here. Click here for a list of the lounges and bars. The Dorsey was one of my favorite lounges! 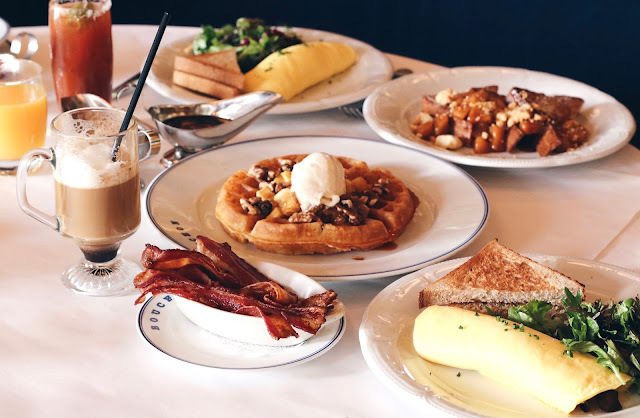 One of my favorite dining experiences, was the delicious brunch I had at French restaurant, Bouchon. The food was so good, I can't even explain it- everything was perfect. Bouchon is now one of my favorite restaurants ever. I especially loved my sourdough waffle with a caramelized banana on top. (Pictured below) If you're ever in Vegas, defiantly eat brunch here, you will not be sorry! On my last night, I saw Baz - A Musical Mash-Up at the theater located inside The Palazzo. As I've stated before, there are countless thing to do and plenty of entertainment at The Palazzo and The Venetian. You can see a list of all of the shows here. I had such a great birthday stay at The Palazzo Las Vegas. Thank you so much for making my stay so rememberable and fun!